Achieving the highest levels in performance and value in utility-scale solar installations requires a holistic approach to the entire system. The next generation of large-scale solar value starts with optimized design, is built on a backbone of best-in-class technologies, and leverages the industry’s most comprehensive service programs to ensure that your investment consistently delivers over its entire life span. Satcon®’s complete utility-ready system solution footprint integrates the industry’s most advanced and proven technologies with the services and programs to ensure that your systems are highly optimized, from the initial design stage, across its operational lifetime, enabling you to achieve the highest levels of total system uptime, yield and performance. 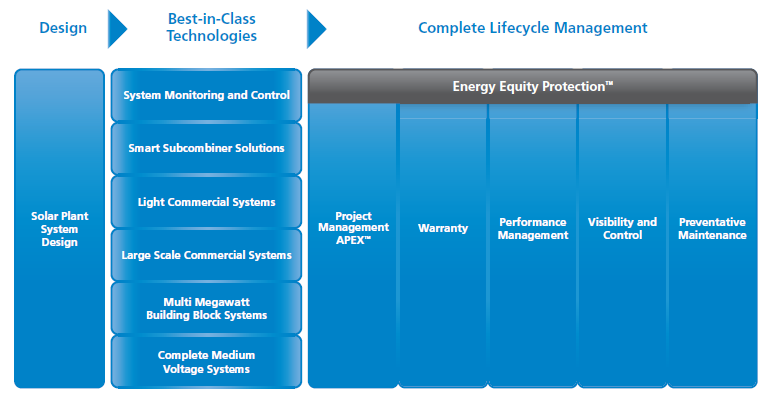 Satcon’s industry-leading suite of service plan options, including Standard Warranty, Extended Warranty, PV Product Care® Plan and Uptime Guarantee, will reduce system downtime and lower your total cost of ownership, enabling you to mitigate risk, while at the same time delivering an increased return on your investment.